Ravioli are a filled pasta that comes from Italy. They are great for making at home as they are relatively easy to shape, unlike their more fiddly counterpart tortellini, which take a bit more practice. The secret of perfect ravioli lies in making beautifully thin pasta, so take your time when rolling and handle with care. For instructions for making the fresh pasta dough, see our step-by-step guide. Lay a second pasta disc over the top and gently mould the pasta around the filling, making sure to remove all excess air that may be trapped to prevent the pasta breaking during cooking. To cook the ravioli, bring a large saucepan of water to the boil, add a glug of olive oil and carefully lower in the ravioli. If the filling is pre-cooked, they will need around 3 minutes. If using raw filling, cook for a few minutes longer. When the fresh dough is not being used, always cover completely with a tea towel to ensure it does not dry out. If not planning to serve immediately, drizzle some more olive oil over the ravioli when taking them out of the water to prevent them from sticking together then reheat in boiling water when ready to eat. For a cheat’s version, you can use won-ton wrappers instead of fresh pasta as Mark Jordan does in his ravioli of duck. If making ravioli out of won-ton wrappers, follow the same method and cooking time. 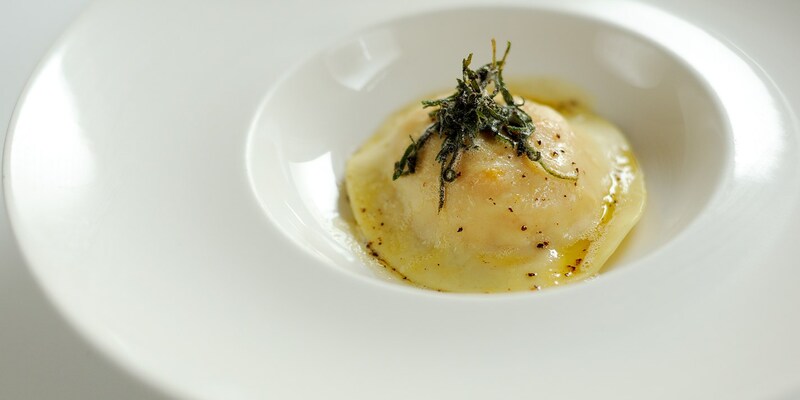 In terms of filling ravioli, anything goes – Alyn Williams’ ravioli has the Welsh classic laverbread at its core and is served in a light onion broth, while Luke Holder has Parmesan and polenta nestled in his signature ravioli. Ravioli can be served with a sumptuous sauce as Richard Corrigan does with his Crab ravioli, while one of the simplest, most classic ways to finish off ravioli is to toss it in some sage butter as Andrew Mackenzie does with his Butternut squash ravioli.